If there are little ones around--these cookies will be a perfect Christmas Eve project. Connie made these with Kristi and Alena and they were most delicious. 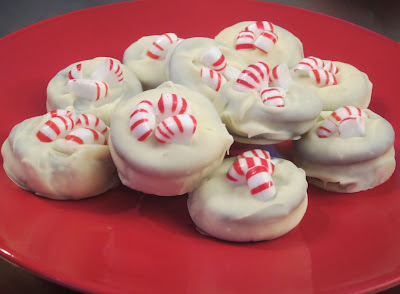 Melt the white chocolate, dip the cookies one by one in it, place the cookies on wax paper, sprinkle with candy cane bits and cool. Suggested soundtrack: Ella Fitzgerald's "Have Yourself a Merry Little Christmas"